Photographing famous people is a fairly common assignment when you?re a press photographer. It?s one that?s always a little more daunting than hard news because you?re faced with the challenge of finding a way to capture this person in a new and interesting manner that other photographers haven?t tried countless times before. Here in the UK the Queen is perhaps the most difficult celebrity to photograph because her picture has been taken tens of thousands of times, if not more. When I got the call to photograph her attending the official opening of a new lawn tennis association at Roehampton in south-west London, my first thought was how I was going to be able to show the Queen in a situation where you wouldn?t normally see her. Official events such as this can be quite stage-managed and leave little opportunity for spontaneity, which makes it tough for photographers to be creative and capture anything beyond the standard handshake. There were throngs of photographers when I arrived, and sure enough, the event was planned down to the very second. The Queen was standing expressionless while someone else was speaking, and I tried framing her in a number of different compositions but none of them worked. I felt like I?d either seen them all before or they just weren?t interesting. Then a thought occurred to me. It had rained heavily earlier that day and was still lightly drizzling. 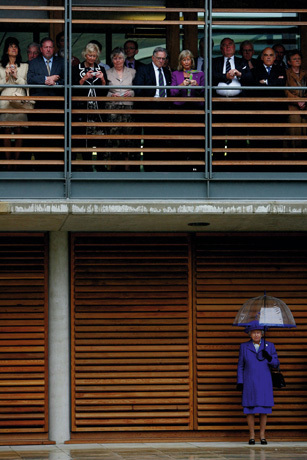 It suddenly struck me as very odd that all the spectators above her were standing under shelter from the rain looking down while she was left to stand outside with an umbrella. You?d expect her, of all people, to be upstairs underneath the shelter! It was the complete opposite of how the scene should be. When I stopped looking at the wider scene through my viewfinder and cut the speakers out of the frame to isolate the Queen, I realised that it looked like she was standing at a bus stop and all these people were watching her. I like to try to capture something slightly quirky or unusual in my images. I?m always striving to inject some humour into my photography when I can. People as well known as the Queen are photographed on a daily basis, so I think you need an element of humour or quirkiness to help you get something that stands out from the crowd of other images. You want to look for ways to make your image unique. In pursuit of this, press photographers will often look for famous people pulling a face or placed within a situation they wouldn?t normally be seen in, and this morning at Roehampton definitely qualified for the latter. Once I recognised the surreal nature of this scene I knew immediately that I needed to emphasise this and compose my image accordingly. Getting in position to take the picture, however, proved to be another big challenge. There were 30-40 other photographers there with me that morning, huddled into a pen by police so we couldn?t pose a threat to national security. I?m sure everyone at AP is well aware of the suspicion cast on photographers by police, and that scepticism extends even to professionals. Where we were positioned was perfect for getting the standard shot of an event like this, but the vantage point wasn?t going to work for the picture that I wanted to take. We were all standing in a side-on position, but I could see where I could get the picture I?d visualised if I could only get a more front-on position. Unfortunately, I was blocked in by a barrier. I decided I could either stand there and shoot something that wasn?t very special or I could jump over the barrier, shoot the picture of the day and deal with the consequences. So I jumped the barrier, ran about 15ft (4.5m) and managed to fire off a couple frames before security came and escorted me back to the pen with the other photographers. At that point it was too late for anyone else to copy what I?d done, as the security team had clocked on to the view that I had seen. And so I managed to get the picture of the day. Later, I filed the image and got lots of calls from reporters wanting to know the story behind the picture because the Queen had never been seen like this before. I like the fact that the Queen is alone in the bottom right-hand corner. I wanted to show that from where I was, it looked like she was on her own with no one around. To her left were all her aides, but depending on how you crop your picture it can make the picture say a million different things. I think the picture is also different because the background is a simple pattern of parallel lines. I like clean backgrounds, and I like things to be neat, so I try to keep an eye out for parallel lines or a blank wall to use in these types of images. A solid white or black wall should be used as a backdrop if possible, as you want to eliminate all distractions within your frame.